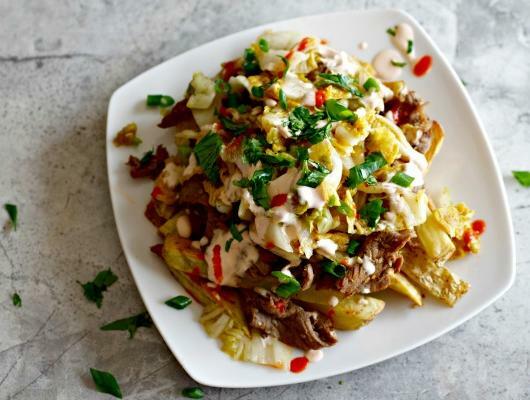 In a large bowl, mix together chopped cabbage and salt. Cover and set aside for at least 6 hours. After 6 hours, place cabbage in a colander and rinse all the salt off with cold water. Squeeze as much water as possible from the cabbage and place in a large bowl. Sprinkle over the cabbage, the sliced green onions, chili powder, fish sauce, ginger, and garlic. Mix all together, cover and place in a dark area for at least 4 days. In a medium bowl, mix all ingredients thoroughly. Cover and place in refrigerator for at least 2 hours. Grill or fry bulgogi over medium-high heat for about 2-3 minutes on each side, or until thoroughly cooked. Set aside to cool slightly. Once cooled, chop bulgogi meat into bite sized pieces. Set aside. In a small bowl, mix all ingredients until well blended. Cover and set aside. Preheat oven to 450. Cut each potato into slices lengthwise and then cut each slice into sticks. Place in a large bowl and toss with the olive oil so each stick is coated. Place potato sticks onto large baking sheet and bake for 15-20 minutes. Flip over and bake for additional 10-15 minutes, or until fries are browned and crispy. 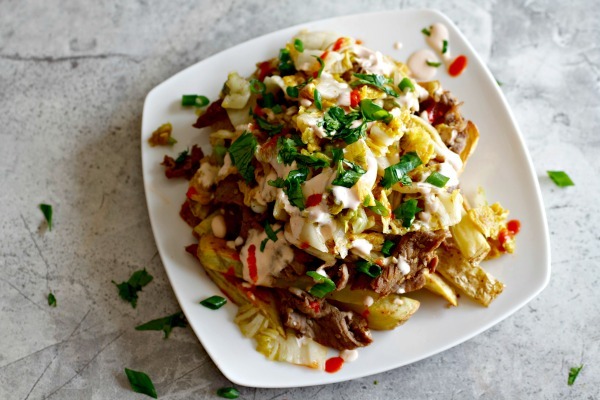 Place fries on plate, top with chopped bulgogi, kimchi, Sriracha special sauce, and any of the optional toppings, as desired.